I think it’s funny that people try to “correct” the spelling of my middle name from “Monè” which is the way my middle name is spelled, to “Monet”, which is the spelling they think is correct. My Mother chose to spell my middle name that way. It wasn’t a mistake. It makes me unique and I love it. I send someone the correct spelling of my name and they take it upon themselves to decide that my middle name is spelled wrong based on their own knowledge of what it should be. Or their own fear that I somehow spelled it wrong and it will make them and their project (program, news article) look bad. In thinking about this it dawned on me that it is the same with knowing who you are as a person and being confident in the personality, gifts and essence that you were given by God. To others it may seem that what you were given is flawed in some way because it doesnt look like what others think it should. THIS IS NOT TRUE!! What you were given is exactly what you were meant to have and it is what makes you unique and qualified for a specific purpose. When you go against that or let people try to mold and change you into what works for them and not you, you are not being true to who you are. In reality maybe my middle name should be spelled “Monet” according to grammatical standards. However, that’s not the name I was given so the only standard to adher to is that of the giver. If you notice God didn’t say it was very good because He got approval from others, but because HE SAID IT WAS GOOD. Because He believed it was good. There was no one else around anyway. He had to have the confidence to declare it was good! Lol! Let’s carry the same confidence as our creator! Say it with me “I AM VERY GOOD just the way I am! !” Believe it and just be who you are!! How do you feel about the term “good hair”? We want to get your perspective on Hair, Self Esteem, and Relationships as we prepare to open “3”, the first installment of the “Nappy Hair and Other Black Girl Blues” series. Comment below! WhAt iS THe FunniESt or MOST abSurD CoMMeNT yOu’VE RecIEvED ABouT YouR HAIR!? We’ve been picking the brains of Women of Color over the past couple days to get their perspective on hair, relationships, and self esteem as we get ready to open our show “3” on September 16th! The first installment of the three- part series “Nappy Hair and Other Black Girl Blues”. Today’s question has got some amazing and hilarious responses. Here are some of the comments below! Let’s keep the discussion going. Your life stories will help this series come to life! Be apart of he magic!! We encourage you add your 2 cents to the mix, via Facebook or RIGHT HERE! WhAt iS THe FunniESt or MOST abSurD CoMMeNT yOu’VE RecIEvED ABouT YouR HAIR?! Bryanna Davis White Girl- Omg!! your hair! It grew so FAST. (day after fresh weave) me- uhhh yeah.. Ok.
Natoya Evans Lady:I love your peoples hair. Jenevieve Hutchison One day back in elementary school while I was using the restroom, a few girls that I didn’t even know came up and started asking me about my hair. Then one of them said, “Let’s count how many braids she has,” and wouldn’t let me leave until they were done. 129 braids later…..
Now, let’s hear from YOU!! The Nappy Hair and Other Black Girl Blues Series!! THE NAPPY HAIR AND OTHER BLACK GIRL BLUES SERIES…. The Nappy Hair and Other Black Girl Blues Series! Show dates and times, Ticket info, Promo Videos, Campaign info, and our Nappy News of the Week!! “3”, the first installment of the “Nappy Hair and Other Black Girl Blues” series, takes a look at the lives of three women connected by friendship and history. 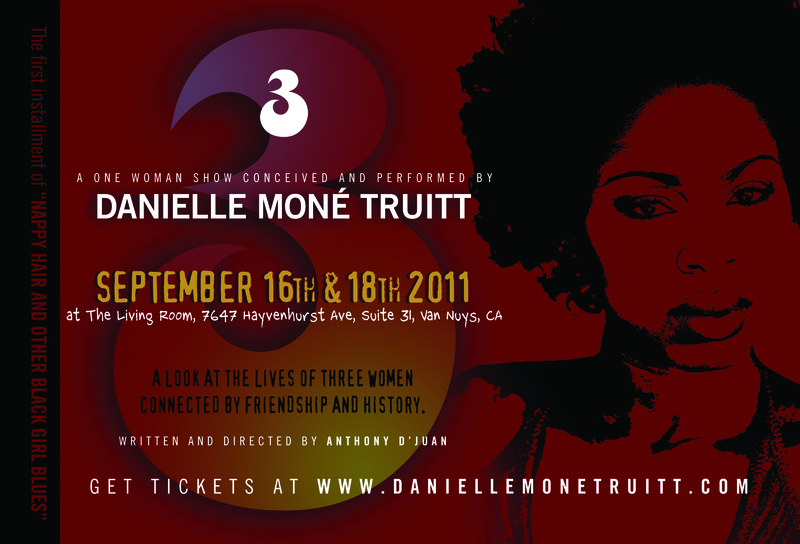 Concieved and performed by Danielle Mone` Truitt. Written by Anthony D’Juan. “3” captures the break down and growth of female esteem rooted around hair. “3” will premire at The Living Room in Los Angeles, California. Show dates and times TBA. Help us produce “3”!! We have until September 15th to meet our goal! So far we’ve raised $100 of our $4500 goal. How can you help? It’s easy! Just click the link below and find out about our awesome show, what cool perks you get for your support, then DONATE!! actual choice for the next single. @NinyaBella states that she really meant that her hair looked ratty. with “Ratty”? I guess it would have been “Ratty” if Rihanna was not black! this term as black females? Or fight against the reference at all cost? faced with ” Nappy Hair and Other Black Girl Blues”. This past Saturday I went to PIHOP (Pasadena International House Of Prayer). On Saturday evenings they have what they call prophetic prayer. My church, The LivingRoom, took a field trip there in April, but I wasn’t able to go because I had just given birth a couple weeks prior. Needless to say it was worth the wait! I was in desperate need of an encouraging word from God. I needed clarification, and confirmation. Well I got that and more! I am still completely overwhelmed by what God spoke to me through the prophetic teams. Some of it I am still trying to digest, but one thing that has been playing back in my head since Saturday is “God is saying yes to you… yes, yes, yes”. If God is saying Yes to me then there is nothing that I cannot dream, pursue, plan, do and prepare for! The promises God has placed on my heart will be fulfilled. I realized I don’t have many Haters in my life. Not “Lebron James” hates atleast (lol)! I have very supportive people that I am connected to for the most part. The problem is that I hate on myself!! I get these ideas of things I want to do and then while I’m planning I talk myself out of it! I literally put myself down and tell myself that what I’m dreaming of is impossible. “You don’t have the money” “You’re not talented enough”, “no one is going to come”, ” your friends & family just support you because they have to not because you’re really that talented or amazing”, and the list of hateration goes on until I put yet another idea on the shelf waiting to be validated by someone outside of myself and God. What THE HECK DANIELLE MONE’!? Well I’m sick and tired of MYSELF!! I am SO SERIOUS when I say this. Where did this fear come from? When did I become so insecure in this area? The Bible says that perfect love cast out all fear! God loves me fully and perfectly and He is saying YES YES YES TO ME! I think somehow I forgot how much God loves me. How much favor He has placed on my life! Or maybe I never really believed He loved and favored me in the first place. That sounds crazy to say but as sad as it is, I think it may be true. In any case, I’m taking His yes, His love and favor and I’m running with it! I will not be held back by the doubt in my own mind. By this enemy that is myself! If God says Yes, who can say no? Dani: (hesitant) Hey God…How are you? God: Oh, i’m doing great! Got a lot of work to do today, but it’s all worth it! God: Dani, Dani, Dani!!! No explaination needed. I heard you when you said that quick prayer on Saturday. We’re good, that’s not what i’m calling about. Dani: OH! (laugh) okay God… whew… So how can I help you? God: Well i’m sending you something. Just something to inspire you and show you what I think about you! Dani: Really God? Thanks so much! I can’t wait! So around 3pm I went to check the mail. Nothing. Disappointed I returned to my door step to find a Lemon sitting on top of a letter. I was totally confused. I thought to myself “Why is there a lemon sitting on my porch? This can’t be what God was sending me!” I mean a present from God would at least be delivered thru UPS and i’d definitely have to sign for it…. RIGHT?!? So I picked up the Lemon and letter and went into the house. I sat on my couch and slowly opened the letter. Then I began to read. I know you are confused as to why I sent you a lemon. You were expecting something much bigger or even better. These days your expectations are huge and I really love that about you, but make sure you see me in the small things too! So, this lemon. This lemon represents you and the call I have put on your life! Though the fruit and its juice have a sour taste to it, lemon is actually a fantastic buffer in the body. Lemon juice and peels have an antiseptic effect and the leaves of the tree are used to reduce fever. In addition, lemons are rich in vitamin C which strengthens the immune system and acting as an antioxant, protects cells from radical damage. Lemons as a therapeutic usage helps anti-inflammatory action. It helps the body cleanse itself by promoting perspiration and acting as a natural diuretic. Kind of gross, but necessary. Lemons also stimulate the appetitie, aids digestion, strengthens body defense system, relieves cramps and also dilates the blood vessels in the skin. 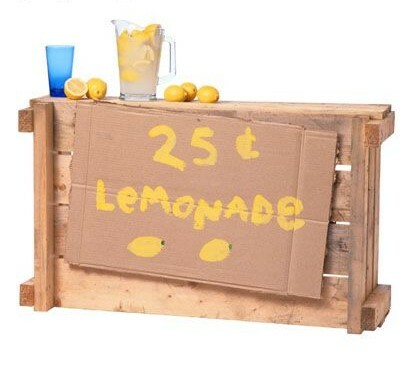 Lemons are known for lots of useful remedies. So, I know you are wondering what all this means. I have given you a very unique personality and make up. I have gifted you in so many areas and sometimes you wonder why and what for. Every single part of you is for my glory. Although you are not by nature, the sweetest fruit, you are an essential part to the healing of my people, and the body of Christ. I will use you as an example of strength and resilience. You will help others to see and access the power that I have put inside of them! Because I have created you to be a “buffer in the body” your antiseptic nature will help protect my flock and will equip them to fight off the attack of the enemy. You will stand for righteousness, and you will be able to recognize and call out the spirit of pride because of your therapeutic nature that helps anti-inflammatory action. Through the arts you will inspire people and “stimulate the appetite” for excellence! You will help people get to core of exactly who they are and let go of the waste they are carrying! I know that most of the things I have called you to are things that you struggle with. I did this on purpose so that you and the body will know that it is I who is doing this work in you! Don’t worry about how people look at you. Those who judge you, and despise your sour taste. Those who say that all you are is a sour lemon. They don’t know you like I do. I love you and I have called you according to my purpose! As an extra token of my love I attached a small bag of sugar. Cut open your lemon and squeeze out some juice. Add some sugar to your juice. now all you need is a little water and it becomes a tasty treat!! This is something special I want you to have when things get hard and the call of ministry weighs on your shoulders. I love you Dani! Dani begins cutting the lemon. She squeezes some juice into a cup and then adds some sugar. She begins to cry. Tears fall into her cup.